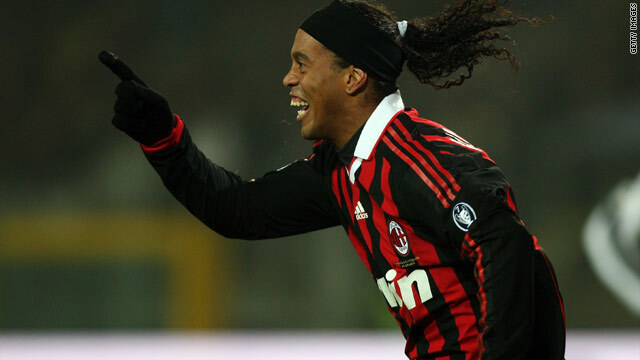 Ronaldinho scored twice to help Milan ease to a 3-0 win at Juventus -- a result that heaps more pressure on Ciro Ferrara. (CNN) -- AC Milan kept up the pressure on Serie A table-toppers and city rivals Inter Milan with a 3-0 win at Juventus on Sunday night -- a result which turns the heat firmly on home coach Ciro Ferrara. Alessandro Nesta put Milan ahead in the 29th minute with Ronaldinho adding a 72nd minute second as Juve struggled to produce a display that would ease the calls for Ferrara's head. Another goal from Ronaldinho two minutes from time came amid protests from the home fans, who shrouded the field with smoke by burning any item possible, and sealed the win for Milan, who move within eight points of Inter with a game in hand. Napoli remain firmly in the hunt for Champions League football after substitute German Denis came off the bench to score the winner against Sampdoria. Denis headed home after 71 minutes to move Napoli on to 33 points in fourth place and extend their unbeaten run to 12 points. Livorno eased their fears of relegation with a hard-fought 2-1 victory over Parma at the Stadio Armando Picchi. Francesco Tavano gave the home side the lead midway through the first period and veteran forward Cristiano Lucarelli doubled their advantage 17 minutes into the second half. Blerim Dzemaili pulled one back for Parma six minutes later but Livorno held on as Francesco Guidolin's side ran out of steam. Substitute Jose Castillo struck the winning goal for Fiorentina as the Viola came from behind against Bari to prevail 2-1 and climb to sixth in Serie A.
Castillo struck the winner in the 74th minute but he was shown a red card 10 minutes from time, with Bari's Sergio Almiron already dismissed for two bookings. Fiorentina striker Adrian Mutu had earlier cancelled out Paulo Barreto's 25th minute opener. Genoa jumped above city rivals Sampdoria in the table thanks to a routine 2-0 win over 10-man Catania at the Stadio Luigi Ferraris. The home side struggled to get into the game until Giuseppe Bellusci was sent off for the visitors in the 28th minute. Genoa went ahead through Giandomenico Mesto in the 36th minute with Giuseppe Sculli sealing their win in the 71st minute before Catania coach Sinisa Mihajlovic was also sent to the stands. Alessandro Matri struck the winner as Cagliari won their first away fixture since October 29, edging strugglers Bologna 1-0 at the Stadio Renato Dall'Ara. Palermo extended their unbeaten league run to five games with Edinson Cavani scoring the only goal against Atalanta from the penalty spot. Udinese halted a worrying run of defeats but could not claim all three points as Lazio held on for a point with a 1-1 draw at the Stadio Friuli. Gianni De Biasi's side went into the game having lost five of their last six games following their midweek defeat by Bari and got off to another miserable start as Sergio Floccari put Lazio ahead after 16 minutes. But Antonio Di Natale's free-kick levelled matters 11 minutes later and neither side could find a second.